Brett and I went to Big Save and Cost U Less on Friday and spent $55.24. Brett went to Walmart on Saturday and spent $7.34, for a total of $62.58, so we ended up $1.04 over budget for the month with the Big Shop. We’re in very good shape for the coming month (and beyond) though, except for a fruit run in a couple of weeks, which will put us even more over budget this month, but probably only around $25 or so at the most. Cost U Less is a funky warehouse store that predates the arrival of Costco. Lots of locals still like to shop there though because there’s no membership fee. They have some of the best produce on the island outside of the farmers’ markets, and also have a huge selection of natural and organic foods, with better prices than the local natural food stores. When we were there we discovered why there was no organic peanut butter at Costco the other day – Cost U Less bought it all and was selling it for $3 more per twin-pack! I’m hoping you can see from the above prices the reason we do most of our shopping at Costco, where prices are the same or only slightly above prices on the mainland. Unfortunately, we can can’t get everything we need there, so we have to shop elsewhere, but we try to keep our purchases at the above three stores to a minimum. You could buy a pound of dry pinto beans and make your own refried beans at home. Use the crock pot for the first cook of the beans, freeze the excess amount in portioned bags, and recook (and smash) the amount you need when you need them. I would cook them from scratch, but we eat refried beans maybe once a year now, so will stick with canned, just for the convenience. Same for most beans these days – they’re just not a favorite around here, so it’s easier to buy a can when we need them. Wow, so interesting! Thanks for sharing. Very interesting. I like the Costco organic peanut butter too. It’s crazy that the other store bought it and was selling it at a higher price. Did you buy it? No!! We bought the jar of Adams. But, it was obvious that people had been buying the stuff from Costco. I’m glad you didn’t buy it. No one should because it just encourages that sort of thing. I didn’t notice the Adams PB in your picture until you pointed it out. I’m not familiar with that brand. We used to buy Adams brand back on the mainland – Costco sold it in BIG. jars. It’s a very good natural brand, although not organic. I was just wondering how much of the bleach you use each month. I also use this method but went with the white puck in the tank which lasts 3 months instead of the liguid form. Just curious, as always. What a clever puss you are over the airline prices! I knew they did that stuff on everyday items, but really! I’ve also become adept at checking for online coupons; I just google ‘coupon for…..naming the site or object’. It’s been pretty useful. Keep writing–love the posts! 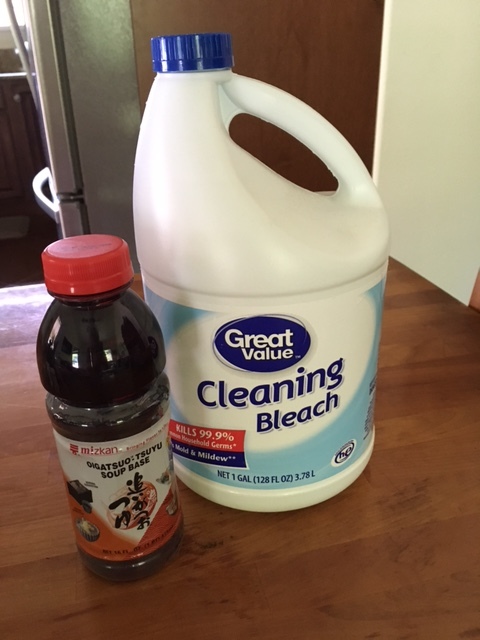 The gallon of bleach will last nearly three months. I add about a quarter cup every 2 or 3 days, which seems to be enough. I haven’t seen the white pucks, but will look next time. I was kind of surprised at how quickly the cookies were activated this time. Usually it takes a few searches, but this time it was immediately. I check for online coupons every time I buy something online! Alexia products are so good. Unfortunately the only place by me that carries them is Whole Paycheck (Foods). Love that store, but cha-ching. And La Victoria salsa is my fave. 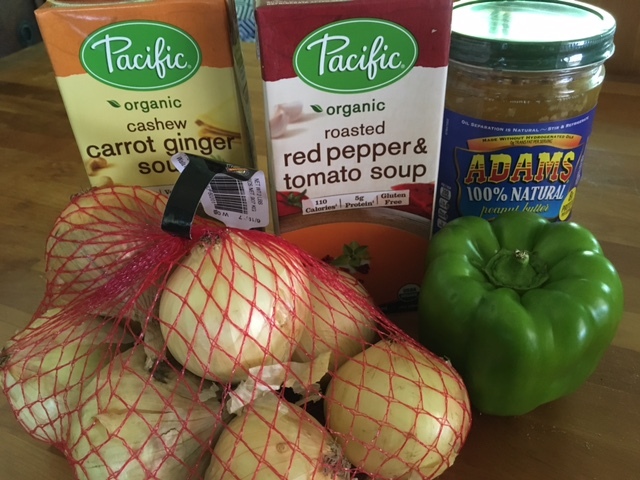 I started making my own roasted salsa, but found its only cost effective unless if I buy the produce at a Mexican or Asian grocers (where the produce for salsa makings is really inexpensive). Which reminds me that I need to pick up some dollar store plastic containers so I can batch freeze some of this stuff when I do make it. We love Alexia products too, and sometimes, if we’re lucky, we see them at Costco here (one of the items we will buy even if they’re not on our list. We bought the La Victoria because it was on sale. 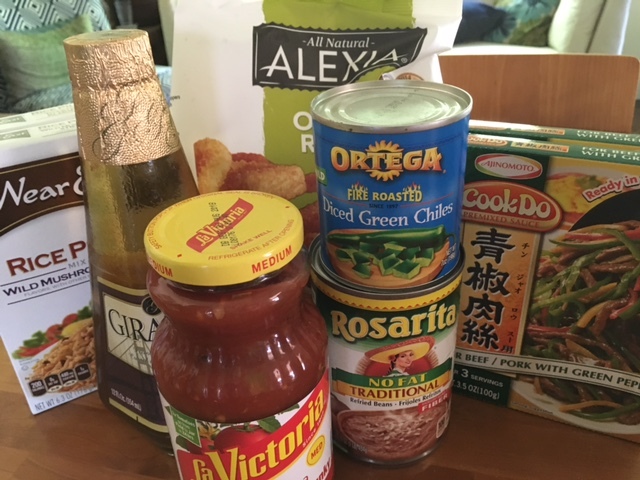 We generally prefer fresh salsa, or pico de gallo, but I’m going to use this to make “Mexican pulled pork” in the slow cooker to use for tacos and burritos. We shopped at the local ethnic markets A LOT back on the mainland – they sold quality meats, and you couldn’t beat their prices for produce.